Inspire Academy is an EL Education (formerly Expeditionary Learning) school. EL Education’s motto is: "we are crew, not passengers", and we use that collaborative mindset to ensure a culture of empathy, perseverance, integrity, curiosity, and quality in our students. At Inspire Academy students and educators are committed to quality work and citizenship. Students take responsibility for each other and for their learning, and in doing so, build leadership skills that help them excel both in the classroom and outside. At Inspire Academy, we challenge students to think critically and take an active role in their classrooms and communities which results in higher achievement and greater engagement in our school. Our students are highly engaged learners, motivated to master academic content and produce high quality work. 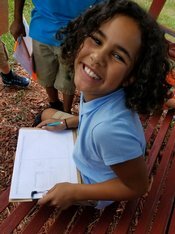 The unique “learning expeditions” at Inspire take our students outside of the classroom and engage them in making our community a better place. You might find one of our students advocating for a recycling effort in his community, or working with the department of natural resources in building bat colonies to help that species. This “learning with a purpose” helps students develop the academic skills and work ethic that prepare them for high school, college, and beyond. At Inspire – we truly think outside of the desk!